5’10 x 20″ x 2 1/2″ for Rory Duff of Cork. Flat and straight, quad. Fin position is derived from the bobsled and adapted to allow for the reduced tail area on this board. I liked this one – it felt like it was going to be a fun ride. 6’4 x 19 5/8″ x 2 5/8″ for Shirley. Shirley absolutely rips on his ‘sled and this board was designed to provide him with that ride feel translated into something that would fly on a bigger canvas. 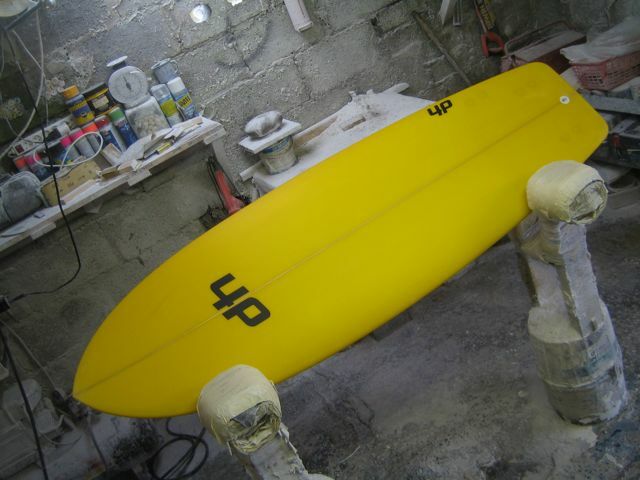 6’2 x 18 3/8″ x 2 1/4″ for Cian. A re-creation of a board I made for Johnny Smith a couple of years ago. I think this is the lightest board I have made. (4+4)+4+patches came in at 2.5kg without fins. I’m pleased that Cian went the flouro – virgin territory! 5’10 x 20 7/8″ x 2 1/2″ Bob of Sled for Jamie. Just a few questions on the Bob Sled do they cover a wide range of conditions? I live on the South coast and we get a lot of weak mush waves on the beachies would it work in them conditions or does it need a clean face and a bit of push in the waves for it to get going.I saw a few in action in Clare a few months back and the guys on them were ripping but it was 3 to 4ft on Cregg left and clean. Thanks for your interest in the bobsled. They are interesting beasts for sure and quite adaptable to different conditions and surfing capability. I guess the best thing about them is that they give you a bit more time to really nail whatever it is that you’re trying to do because they paddle well (bit of volume but not excessive) so you get in easy and also because they glide through soft sections on slack waves. They are also pretty good at beating sections which can make the most of a sectiony slop fest, I guess. The thing that makes a bobsled better than a retro fish or mini-mal or the like is that I have them set-up so that when you get moving on a really good wave they are all speed and control and acceleration through turns. All those things are applicable in really good waves and really average waves alike, so in short, I’d say they do work well in a range of conditions, including mush. The downsides are that they feel different to a normal surfboard which means that you have to get used to them (this doesn’t suit everyone – typically your standard 6’2×18 1/4 x 2 1/4 thruster guy doesn’t get it) when you get on one and also get ‘un-used’ to them when you get off one! Also they aren’t the best in really messy stuff as the wide tail and bottom contours don’t like big chops. I probably surf mine more than any other board though! Thanks for taking the time out to explain really helpfull.I gave up surfing thrusters a long time ago and have been surfing a Pavel Speed dialer for the last three years.So when i get the deposit to gether i will give you are ring and talk some more.Thanks Tom.